Our student population this year has students all over the educational spectrum. Some students require the use of a computer to produce their writing, others require graphic organizers and there are those that just refuse to write because they can not put their thoughts down on paper. Our school purchased the MAC software version of Dragon Naturally Speaking for a classroom computer. 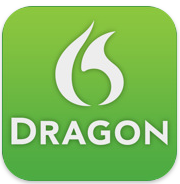 When researching more about Dragon Naturally Speaking, I happened to come across an assistive technology app that would run off of an Apple device called Dragon Dictation both of which are designed by Nuance Communications. I began to wonder how we could use this in the classroom or even at home with the help of a parent through our handheld devices such as the iPad or the iTouch. Initially my energy level towards this app were very high as I had great expectations of how it might accommodate our population of struggling writers. Unfortunately, I quickly found the limitations of the app when using it on an iTouch. When you enter the app you are immediately instructed to tap the screen to begin recording. In order to do so, you will need to connect your earbuds that have a microphone on them. Once you have completed your recording, hit the DONE button. It will then process your recording onto a blank screen. As I reviewed my recording I noticed that there were no signs of punctuation. Interesting….so I decided to do a little searching on the web and came across a link with Tips and Tricks. After having viewed it, I was able to figure out that I had to speak what punctuation was necessary. I was impressed with it’s recording abilities being so accurate. However, I was a little disappointed to see that I could not press a button which allowed me to hear what I just wrote so as to check for fluency. Besides having struggling writers, these same students also have challenges with punctuation and yes, even capitalization. If a user sees an error(s), tap at the beginning of the error and scroll with your finger to highlight what needs to be removed. In addition, you can also tap the screen to edit a mistake and rerecord wherever necessary. Just be certain to place the green cursor where you would like the recording to begin. So what do you do with your recording now? You can select to email it, copy and/or post it on Facebook and/or Twitter. Unfortunately, having this application on an iTouch, limits the ability to copy the text and add it to another application. I attempted to copy my text and paste it into my Notes application but was unsuccessful. Returning back to Dragon Dictation to find that my last recording was no longer there. A thought to the developer – might it be possible to add the option to save recordings for future use if a student doesn’t finish in the time allotted. For Dragon Dictation to work effectively with my current population, I feel as though some things might need to be considered for the next update. 1) Recording with a play back option and 2) the saving of those recordings. In addition, I don’t know that I would recommend using this application with elementary students and an iTouch. At this level, we do not use student email accounts and Facebook is blocked. Although Twitter has a great deal of validity in the classroom with our students, I am not quite sure if this is a priority for those students struggling to write a paragraph. If you happen to have an iPad, this application might open other opportunities for students. As I am unaware of its capabilities, I do question can you multi-task and have Dragon Dictation open at the same time as having a word processing application. If this were possible, once in the word processing application, a parent or teacher could sit with their child/student to conference such errors like punctuation and capitalization. If so, then I would definitely recommend downloading Dragon Dictation. If you want to learn more, then please check out their website here. Or you can start downloading it for free today in iTunes here. Moms With Apps is a collaborative group of family-friendly developers seeking to promote quality apps for kids and families. IEAR is a grassroots community focused on taking a closer look at the educational value of educational apps!